SalesChecker is a semi-random name adware. As you can probably tell, this application generates a different name with each installation. You can still recognize that it is the same program because the name looks somewhat familiar. The most important thing is that if you recognize this program, you need to remove SalesChecker at once. Do not keep it on your computer because it is nothing but an annoying application that my inadvertently redirect you to malware-related websites. You are also encouraged to scan your PC with a reliable antispyware tool because such programs like SalesChecker seldom travel alone. In reality, there is nothing new about SalesChecker. It belongs to a family of adware that are based on JustPlugIt engine, and all of the applications from this group are known to randomize their names when they get installed on the target system. For example, SalesChecker may change its name to SalesCheckerr, SalesChaeckeer, SalesCheCkeer and many other variants. The same behavior is common to Deal4me, ShopNDrop, CoupExtension and an entire list of other applications from the same batch. Apart from these similarities, SalesChecker is also distributed, in the same way, like its predecessors. Needless to say, this application does have an official website at saleschecker.info, but there is no direct download link. Thus, bundled downloads are the main distribution method employed by SalesChecker. This application usually travels with third-party installers; such as InstallRex, Vittalia and Amonetize. It is important to note that SalesChecker is mostly distributed via InstallRex. 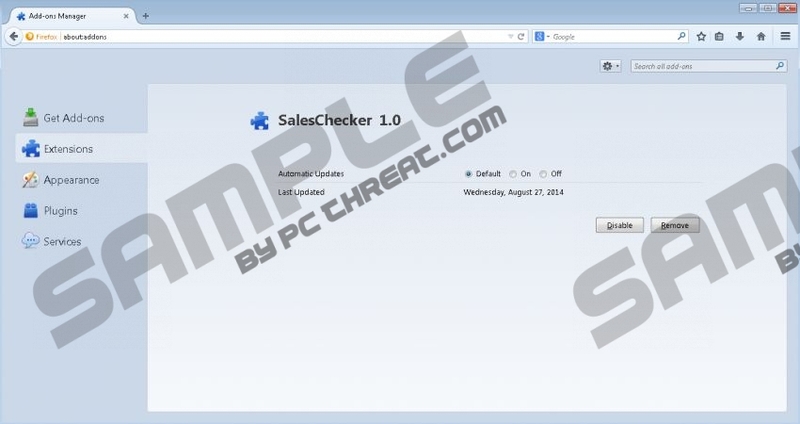 It is obvious that users seldom notice they are about to install SalesChecker onto their computers. The installer file for this application usually hides behind a fake download link on a torrent or some p2p website. It means that whenever you download files or programs from third-party file sharing web pages, you should be very careful about where you click. You might accidentally download a galore of unwanted adware applications that could seriously slow down your computer performance. SalesChecker says the application will collect information on various discount programs on a number of online stores, and the information will be delivered to you at once. Nevertheless, the application does not check the credibility of the ad content, so whenever you click something, you do it on your risk. Since SalesChecker relies on third-party advertising networks for the ad content, almost anyone could embed their content into the ads as long as they knew how. This poses certain computer security risks that cannot be overlooked. Removing SalesChecker is your best choice if you want to ensure system stability. When you uninstall SalesChecker via Control Panel scan the PC with SpyHunter free scanner to check for other adware applications. Do invest in a licensed antimalware tool if need be. Select Uninstall a program and remove SalesChecker. Go to Uninstall a program and remove SalesChecker. Click Start menu and navigate to Control panel. Open Add or remove programs and uninstall SalesChecker. Disable and remove SalesChecker from Extensions. Go to Extensions and remove SalesChecker. Quick & tested solution for SalesChecker removal.